LAUREL STEPS IN TO HELP OLIVER - Slabside becomes even more dangerous after a guard is murdered and everyone is a suspect. 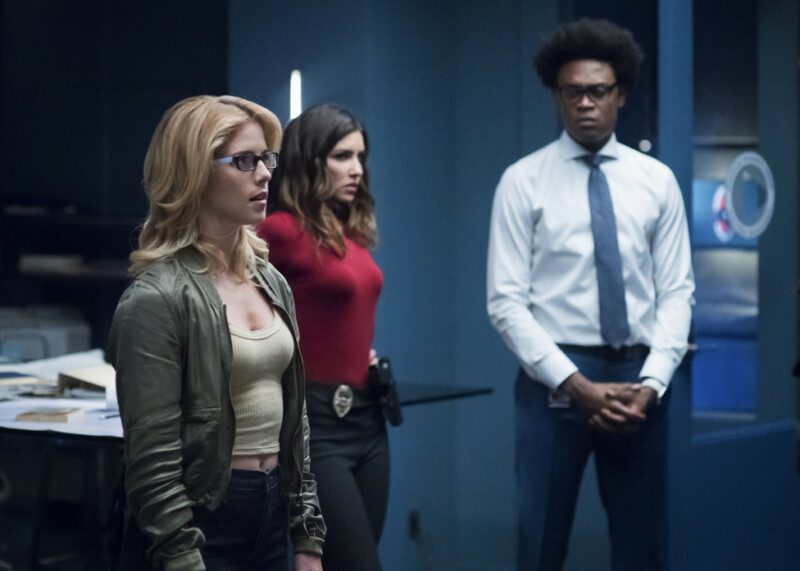 Felicity (Emily Bett Rickards) enlists help from a surprising source in her pursuit of Diaz (Kirk Acevedo), and Laurel (Katie Cassidy) flexes her muscles as the District Attorney. Kristin Windell directed the episode written by Sarah Tarkhoff & Tonya Kong (#706). Original airdate 11/19/2018. The best part of the episode was Felicity's outfit. So in other words, very lame. But at least they finally started to reveal the little twit in the prison is working with the bad guys. So hopefully the whole prison arc resolves around the point of the crossover episodes. I'm down to watching the scenes involving Laurel. Cassidy is still bringing it as an actress, even if everyone else is going through the motions. Stanley is going to be a serial killer or something, has to be- maybe a plant by Diaz. The current GA is future William. I agree, Cassidy is still the best part of the show. Doesn't hurt she's smokin' hot. Have to say, Stephen Amell has a good mean mug. I don't think I would feel comfortable if Oliver Queen was looking at me the way he was looking at Stanley at the end. By the way why didn't Stanley just say the guards told him as that is the reason he got out of the hole? Ok, I have a new theory about the new GA. I no longer believe it’s William from the future. I think it’s Grant Gustin. Those who have seen the trailers know that they somehow are in each other’s identities during the crossover. Maybe they’ve been building towards it right under our noses this whole time. I like the Lyla/Lyta (Diggle's wife) suggestion I saw somewhere. I sure hope not. No way that comes off as believable when it comes to the hand to hand combat element. Isn't it bad enough they tried to pass of Laurel and Speedy as superior fighters?